I have a 2017 JK 2 door and just picked up a Yaesu FTM-100DR that I am trying to find a safe place to mount. Right now, it is temporarily mounted under the driver's seat velcroed to a bracket. After 2012 Jeep changed something with the driver side seat and while there used to be room to put a try, that room is now gone. I am looking at under the steering column where the Alpine amp would go but it is kind of a tight fit with the wires under there and I would prefer to save that space for a small amp I have plans to buy. I do not want to mount it above the mirror either. 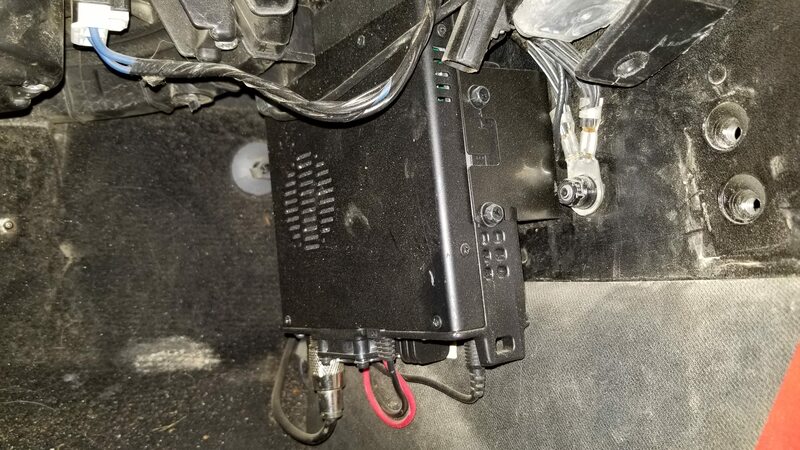 I can permanently mount the radio under the driver's seat although under the seats always seems to get so dirty with mud/dirt/snow from shoes, receipts, french fries and potentially moisture. I was thinking about the best place I can find it on the transmission tunnel on the passenger side up high as I can get it. That area seems to stay pretty clean and is up a little higher than under the seat away from stuff. Question is, even though I hate to do it, any issues or hidden things Id have to worry about with screwing into the tunnel to hold the bracket? We do not salt the roads (PNW) but any advice to protect as best I can from rust? Any other mounting places or alternatives to drilling? https://www.quadratec.com/products/96080_0201.htm I use one of these only the one for the 510/520 uniden. Does the Yaesu have a remote head? If so, under the glove box or the passengers kick panel are good places. My Kenwood is on the kick panel after frying one mounted under the seat due to getting caught in a torrential downpour without a top.